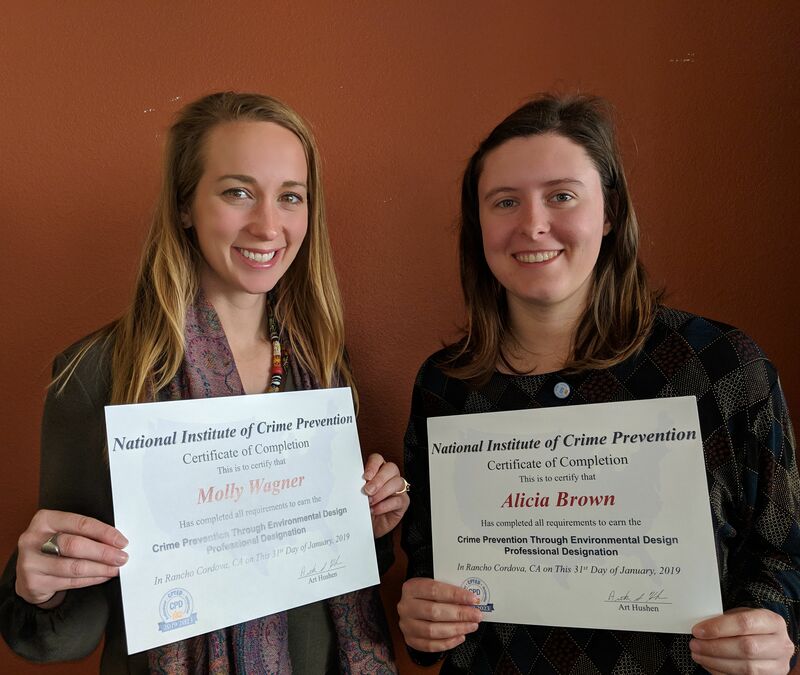 Congratulations to WALKSacramento staff Molly and Alicia for receiving their Crime Prevention Through Environmental Design Professional Designations this month! Crime Prevention Through Environmental Design (CPTED) is a multi-disciplinary approach that prioritizes design strategies in the built environment to create safe spaces and deter criminal activity. While born through the law enforcement field, we’ve found that CPTED principles complement and coincide with planning best practices for creating resilient, livable communities. Molly and Alicia recently completed the three-day advanced training which fulfilled their requirements for receiving the CPTED Professional Designation. The advanced training dove into more specific CPTED applications for parks, schools, and transit, building upon concepts learned in a weeklong basic training in September. Both trainings involved a combination of in-depth lecture, classroom exercises, and on-site practical assessments, and two written exams. Molly and Alicia broke down some of their main takeaways and how they plan on applying CPTED in the Sacramento Region. Natural Surveillance: Focuses on increasing the number of “eyes on the street” and amount of positive activity in an area in order to deter criminal activity, based on the assumption that perpetrators do not want to be seen. Natural Access Control: Focuses on guiding movement in and around a site. Unclear site layouts, multiple points of entry, and lack of wayfinding can create opportunities for crime through confusion. Territorial Reinforcement: Focuses on community pride and sense of place. Elements such as public art, maintenance, and border definition help foster ownership and clarify the boundaries of public, semi-public, and private spaces. Maintenance: Focuses on keeping an area clean and well-maintained. Places with litter, graffiti, and overgrown landscaping send a signal that no one cares what happens in that area. Conversely, a clean space creates a sense of ownership and a feeling that people are watching over what happens in that space. Ground cover landscaping should be no higher than two feet from the ground and tree canopies should be no lower than 6 feet so as to maintain clear sightlines and remove potential areas of concealment. Much like Safe Routes to School, CPTED focuses on a combination of built environment and social programming strategies. CPTED does NOT include strategies such as cameras, added security measures, or “target hardening” (walling off properties, shuttering windows, etc). In some cases, a combination of CPTED and additional security may be needed. However, CPTED strategies should be considered first before security measures are taken. A maintenance plan is critical to the ongoing success of a site. Plant species should be chosen based on their maximum growth sizes to reduce the need for and cost of maintenance. Lighting is important, but not all lighting is created equal. Glare and light trespass can be more harmful than helpful, so light fixtures should keep light on the ground to reduce glare as much as possible. Choosing the correct type of lighting for an environment is important for humans but also wildlife, as certain light sources can negatively affect wildlife survival. Walkability and active design goes hand in hand with CPTED. Communities that prioritize active design can bring more eyes to the street and generate positive activity, compared to communities where low density and car-oriented development creates a sense of isolation. Placemaking efforts such as public art, wayfinding, and pop-up activities not only make communities more vibrant and fun, but are also common CPTED strategies. Similarly, incorporating CPTED along streets and at community destinations such as schools, parks, and businesses can encourage more people to walk or bike by improving the feeling of safety. We will share information with community groups, business associations, developers, and local agency partners about the benefits of CPTED and incorporate CPTED assessments and recommendations into our community planning work. Working with our local agency partners, we will assist with developing policy language that prioritizes CPTED and incorporates best practices into zoning codes and ordinances. As part of our development review process, we will review site plans through a CPTED lens by considering building and site orientation, areas of concealment, placement of activity generators, windows, lighting, and more. To shift to a more positive framework centered around resilience and livability, we will continue to expand upon the definition of CPTED to incorporate “Public Safety Through Environment Design” strategies.